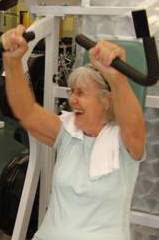 Anne Kuhn had a goal that is familiar to many: she wanted to lose excess fat and gain muscle mass. To help keep her on track and motivated, Anne enlisted the help of Personal Trainer, Andrew Hannah. She meets with him one time a week to weigh in and to go through a strength training routine. Anne is also dedicated to doing cardiovascular exercise 3-5 times a week and one more additional day of strength training on her own. In September of 2011, Andrew challenged Anne to a new eating pattern: for three weeks at a time, she wasn’t to eat anything that contained more than 12 grams of sugar and zero alcoholic beverages, followed by one week of no restrictions. This new eating pattern combined with her workout routine really worked for her! At first, Anne was challenged to sustain this eating pattern through the end of the year. But now, she is considering making this eating pattern a permanent one! Since starting personal training with Andrew Hannah in January of 2009, Anne Kuhn is happy to say that she’s lost 10 pounds of fat! Without Andrew’s encouragement along the way and his readiness to praise her small successes, Anne would most likely have become discouraged. It took Anne awhile to let Andrew’s patient advice and encouragement guide her along a path of improvement. But now she is able to see that every small step she takes bring her close to where she wants to be; a path she knows she’ll be ableto sustain for the long haul! See our Events Section for the next meeting or call our Healthy Solutions Program office, 896-3900 x124. Or for more information, call (502) 896-3900, or contact us online.